The TLC1542C, TLC1542I, TLC1542M, TLC1542Q, TLC1543C, TLC1543I, and TLC1543Q are CMOS 10-bit switched-capacitor successive-approximation analog-to-digital converters. These devices have three inputs and a 3-state output [chip select (CS), input-output clock (I/O CLOCK), address input (ADDRESS), and data output (DATA OUT)] that provide a direct 4-wire interface to the serial port of a host processor. These devices allow high-speed data transfers from the host. In addition to a high-speed A/D converter and versatile control capability, these devices have an on-chip 14-channel multiplexer that can select any one of 11 analog inputs or any one of three internal self-test voltages. The sample-and-hold function is automatic. At the end of A/D conversion, the end-of-conversion (EOC) output goes high to indicate that conversion is complete. 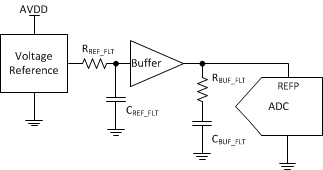 The converter incorporated in the devices features differential high-impedance reference inputs that facilitate ratiometric conversion, scaling, and isolation of analog circuitry from logic and supply noise. A switched-capacitor design allows low-error conversion over the full operating free-air temperature range.